Ms. Rita Payne is a freelance journalist, media adviser and Chair of the UK branch of the Commonwealth Journalists Association whose main mission is to promote media freedom and the protection of journalists. She is regularly invited to write, address, moderate or organise debates and discussions on topical issues for the CJA and outside organisations. Until her retirement in 2008, she spent nearly thirty years with the BBC. 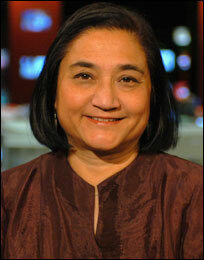 Her last position was Asia Editor, BBC World News (TV) with responsibility for three news programmes a day. Before moving to TV she was a news editor/producer/presenter at BBC World Service radio. She has been invited to moderate two sessions at the UN World Urban Forum in March, 2010. She was shortlisted for the BBC Global Reith Awards 2009. Her speech celebrating the International Day of Women, 'Women and Success: Is Hard Work Enough?' can be read here.